This story was updated at 4:23 p.m. ET. A huge, dead satellite tumbling to Earth is falling slower than expected, and may now plummet down somewhere over the United States tonight or early Saturday, NASA officials now say. The satellite has been slowed down by a change in its orientation. But that plan has now changed. While 75 percent of Earth's atmospheric gasses are within 6.8 miles (11 kilometers) of the planet's surface, air molecules in the atmosphere start to affect satellite re-entry 10 times farther out, at about 75 miles (120 km) above the surface of the Earth. These air molecules drag satellites down, ever so slightly. The lower a satellite gets, the more drag there is and the harder it is pulled toward the surface. Properly functioning satellites, including the International Space Station, have onboard propellant used to adjust their orbits as needed. 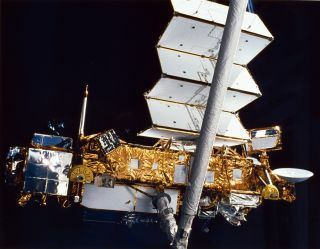 In addition, the flux in the sun's output causes Earth's atmosphere to constantly swell and retract, changing the amount of drag satellites experience. As the satellite tumbles around Earth its orientation in space changes, which can produce less or more drag and either delay or speed up its re-entry, experts explain. "Headwinds slow the satellite down and make it re-enter [the atmosphere], because they produce drag," Johnathan McDowell, an astrophysicist at Harvard University, told SPACE.com. "The satellite is a funny shape, so if it is belly flopping through the solar wind or if it is doing a nice swan dive, that can change how quickly it falls," McDowell said. The satellite probably settled into a sleeker descent, producing less drag. "That's making it stay up a little longer; it just doesn't want to come down." "There is a low probability any debris that survives re-entry will land in the United States, but the possibility cannot be discounted because of this changing rate of descent," NASA officials wrote. It is possible that the stresses of the atmosphere will either break off pieces of the satellite or cause it to change orientation again before it re-enters. It's possible that this could additionally delay the descent, since drag on the satellite will again be lowered, McDowell said. "What tends to happen, when it gets to the denser parts of the atmosphere, is that the parts can break off or the parts can melt," McDowell told SPACE.com. "That will change its drag and the degree to which it will be slowed down." Unofficial estimates by The Aerospace Corp place the strike sometime between about 6 p.m. and 4 a.m. EDT, according to the Associated Press. During some of those hours, the satellite will be flying over parts of the United States. McDowell believes the satellite will re-enter a few hours either before or after midnight, and most likely the debris will land in the Indian Ocean.